I am pretty excited. 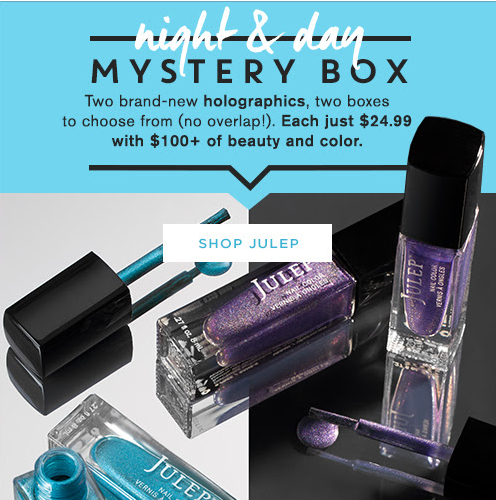 The Julep July 2015 Mystery Boxes are now on sale. There's two of them... And theres NO overlap! I feel like its been a long time since there's been no overlap in their boxes. Of course this just means I want both of them. Especially because those polishes are gooorgeous holographics! The Holo Nights Mystery Box features Christa, a purple twilight liquid holographic and the Holo Days Mystery box features Hallie - a bay blue liquid holographic. There is no overlap between the two boxes and each box contains at least $100 of nail and beauty products for only $24.99. I want them both SO BADLY! But I think I'm just going to stick with the Holo Nights Mystery Box with Christa. I love purples. If you want to get one or both of these boxes, you can do that here! Remember these are only available until the 13th so you'll have to make up your mind fairly quickly. Use code JULEPBBFREE and get a free polish with your order. You must pick a polish and add it to your order for the code to work. Also!!! If you buy and you use Ebates, make sure you activate it. You'll get 5% cashback right now. Offer expires on 7/13/15 at 11:59 PM PT, or while supplies last.